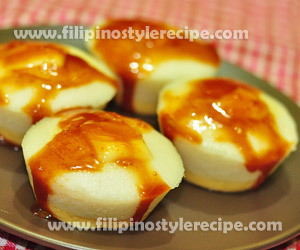 Filipino Style Recipe: Puto Flan with Caramel Sauce is a Filipino favorite mid-afternoon snack (meryenda) made of puto bread with leche flan then drizzle with caramel sauce. 1. In a bowl, combine mixture then whisk until well blended. 2. Grease moulds then pour leche flan mixture 1/2 inch full. 3. Place into steamer then cover with cheesecloth, steam over low heat for 10 minutes. 4. Remove from steamer and let it cool. 3. Combine both mixture then add food color. Mix until no lumps and smooth. 4. Strain mixture using clean cheesecloth then pour over leche flan until almost full. 5. Place into steamer then cover with cheesecloth, steam over low heat for another 10 minutes. 6. Top each puto with leche flan then steam for another 5 minutes or until a toothpick inserted into the centre of a puto comes out clean. 7. Remove from steamer and let it cool. 1. In a pan over medium heat, put the sugar and wait until it starts to melt. Do not stir the unmelted portion as this will cause the sugar to harden. The sugar will turn to thick amber colored liquid. You may now start stirring careful not to burn the sugar. 2. Stir the butter until completely melted. 3. slowly drizzle thhe all purpose cream . The mixture will bubble rapidly, continuously stir until the cream is evenly incorporated.The mixture will thicken once cooled. 4. Remove from heat and stir half of the salt. You may add the other half depending on your preference to the saltiness of your salted caramel. Allow to cool before drizzling to puto flan. 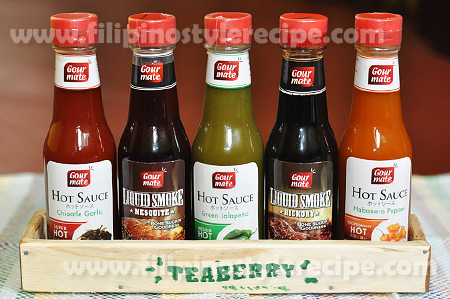 Note: Put in a bottle and cover tightly if not yet to be used. You may store this in the refrigerator for up to two weeks. 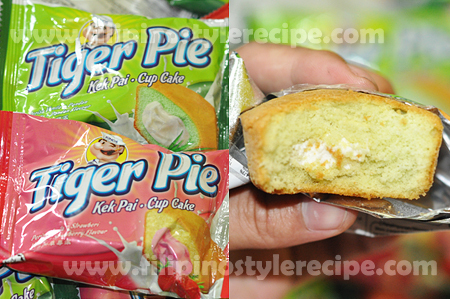 Filipino Style Recipe: A Philippine favorite meryenda (mid-afternoon snack) made of puto bread with leche flan. 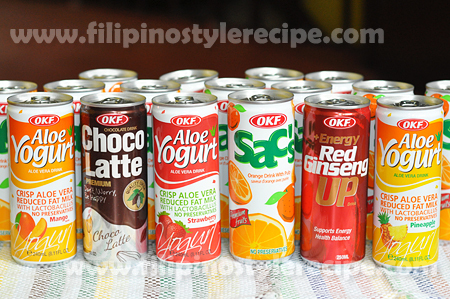 Filipino Style Recipe: how to make egg white leche flan dessert? 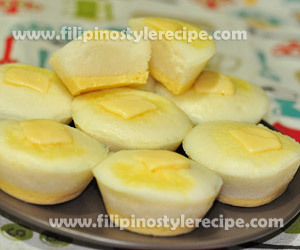 Egg white leche flan is similar to usual leche flan but instead of egg yolk we will use egg white. First we have to dissolve and caramelize the brown sugar in a molds then pour the white egg mixture then cook in a steamer until firm. Estimated time of preparation and cooking: 60 minutes. Good for 4- 5 llanera aluminum molds. 1. In a sauce pan, dissolve brown sugar with water over low heat until golden brown. Swirl gently. 2. Pour the syrup in the aluminum molds then spread evenly. 1. In a mixing bowl, combine the other ingredients then whisk well. 2. Strain and pour the mixture on top of the syrup for about 1 to 1 1/4 inch thick. 3. Cover with aluminum foil then steam in medium heat for about 40-45 minutes. 4. Remove the molds and let it cool at room temperature then refrigerate for several hours before serving. 1. To remove the leche flan from mold, run a thin knife around the edges of the mold to loosen the leche flan. Place a platter on top of the mold and quickly turn upside down to position the golden brown caramel on top. 2. 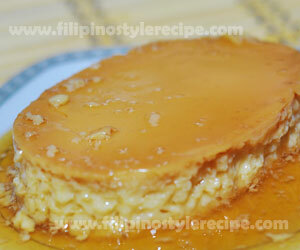 Leche flan is cooked by inserting a knife in the center comes out clean.